In the 1990s, Star Trek was a viable property for kids, collectors, and fans. After Galoob let its license lapse, Playmates picked it up in 1991 for a really hot line of figures which lasted until people rediscovered Star Wars in 1995... and then the decline set in. Early in the figure line's run came this Classic Star Trek boxed set, which was priced much too high for kids, and collectors didn't seem crazy about the price either. Playmates put Spock and the entire bridge crew in a big window box with a removable bridge diorama, inspired by the original sets and just about as sturdy too. Back in this era, Playmates' figures had exaggerated heads and hands, plus frequently shared tooling-- surprisingly, these figures don't share too many parts and they don't all have the same body. 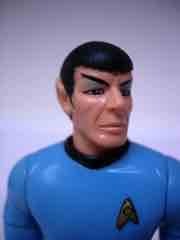 Mr. Spock's head looks less like Nimoy, and more like "Spock" in the sense that he has the ears and some makeup. His coloring isn't quite like the show, but there's no mistaking him for another character. Multiple Spock figures were made in the run, but most had the same basic head and few used the regular original TV uniform-- so really, this is the go-to figure (and set) for fans of figures of this era. All Star Trek figures from Playmates (up until the last few waves in the late 1990s) had the same level of articulation-- swivel shoulders, neck, biceps, and hips along with bending knees and elbows. 12 points of articulation became the norm and fans of other figure lines were understandably disappointed when they didn't meet Playmates' then-high standards for likeness sculpting and mobility. In short, this figure represented the high point of action figures as toys and as collectibles in the 1990s-- Kenner's Star Wars relaunch and McFarlane's wildly popular Spawn lines. But enough history. As Spock figures go, this one is pretty good-- the added makeup and the face proportions aren't perfect but they're certainly good enough to fit in with the line as a whole. Mego's got the hair and the ears right, and Diamond Select's are basically OK-- but this one feels more like a toy than all of those. He can stand and sit, and his one flaw is also a feature-- his right hand is locked in the "Live Long and Prosper" pose, and can't hold his accessories. 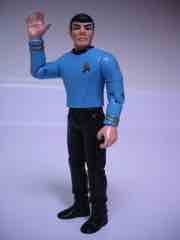 Thankfully his other hand can, but you'll have to pick between his phaser or his communicator, which is a bummer. The sculpt captures the character's look and personality nicely, although his skin coloring could have been a little better. He could also stand to look more like Nimoy, but the haircut and ears do most of the work of bringing the character to life as a toy anyway. This boxed set-- which we'll be looking at over the next few months-- is a solid release and is arguably better as a boxed collectible these days. It just looks solid, and it's a nice presentation. The old boxed set is essentially worthless-- no recent sales on eBay have had bids-- so you can get one for $20 or even less. At that price you can't afford to skip it, it's a wonderful collectible and the figures hold up nice given they're nearly 20 years old. To miss this set would be... well, maybe not illogical, but it's your loss. This is the last time a toy company made the original Enterprise crew as toy figures, other future license holders made releases which feel more like collectibles, whereas these seem like things that should be enjoyed by young kids-- despite being individually numbered on the box.